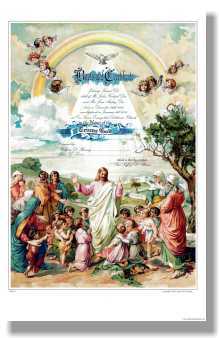 Perfect for a child or infant Baptism, we have been able to bring back much of the brilliance in this colorful certificate. A large illustration of Christ summoning the children unto him stands as the focal point near the bottom of the page. Above, a rainbow flanked by cherub style angels stands over the dove, representing the Holy Spirits presence. “In the Name of the Triune God,” is proudly stated in illustration at the center of the page. The children at the bottom of the page were given particular attention by the artist with each having beautiful expressions of love, kindness and caring.